David Taylor arriving at the Tribunal this morning. THE FORMER HEAD of the garda press office has told the Disclosures Tribunal that he never sent text messages smearing Maurice McCabe to the media, despite assertions from a number of other parties that he told them he had. 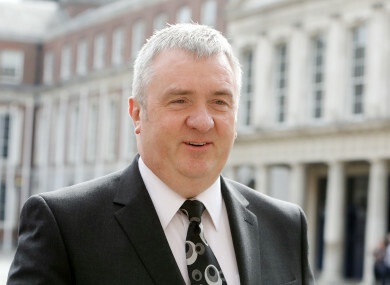 David Taylor was giving evidence for a second day at Dublin Castle today, and refuted the claims of journalist Mick Clifford, John McGuinness TD and McCabe, himself, that he had told them he sent negative texts about the whistleblower to journalists. The Tribunal is currently looking into claims made by Taylor that he was directed to orchestrate a smear campaign against McCabe by then-garda commissioner Martin Callinan. He also claims that then-deputy commissioner Nóirín O’Sullivan was aware of the alleged smear campaign. Yesterday, we heard that Taylor’s claims are denied by both Callinan and O’Sullivan, and also by a number of journalists – named by the former press office head – who said Taylor never gave them these negative briefings. This alleged smear campaign comes against the backdrop of a major gardaí scandal at the time in 2013 and 2014. McCabe had helped bring to light misuse and misconduct within the penalty points system, and put it in the public domain. Taylor alleged that he was ordered to discredit McCabe by Commissioner Callinan as a way to try to present an alternative narrative about the whistleblower. He claims he was ordered to tell journalists that McCabe was making allegations against the gardaí because the whistleblower was “motivated by revenge”. Taylor also said he would inform journalists that McCabe had been subject to a sexual abuse allegation in 2006 – for which he was completely exonerated. It is Taylor’s case now that he gave all of this information verbally, but this has differed from the account of others. Maurice McCabe and John McGuinness have told the Tribunal they met Taylor in 2016 and 2017. They have said that Taylor told them that he would have sent a multitude of texts messages to journalists as part of the McCabe smear. The Tribunal also heard a statement from Mick Wallace TD, who said that Taylor told him he’d sent hundreds of negative text messages about McCabe. In response to all of these assertions, Taylor said that this wasn’t the case. Another statement that Wallace said Taylor made to him about Nóirín O’Sullivan was disputed by the former garda press officer. Wallace alleged that Taylor told him “when she moves, she’s lying,” in relation to the former commissioner’s body language. Taylor denied ever saying this. The Tribunal heard today that Mick Clifford – who has written a book about Maurice McCabe – sent Taylor a proof of a chapter of the book where he mentions that the former press officer would have sent texts denouncing the whistleblower. He also denied knowing of the details of the original sexual abuse complaint made by Ms D against McCabe in 2006. Taylor said that he asked Callinan for the file on the case, but this was denied to him. A statement by journalist Alison O’Reilly was put to him, where she claimed colleague Debbie McCann told her details of the case that had been given to her by Taylor. Taylor was also asked about the timing of his protected disclosure in September 2016, where he made the allegations about Callinan and O’Sullivan. At the time he was suspended from duties, and he was asked whether he made the disclosure because the criminal investigation into him was “in the balance”. He also said that Clare Daly TD had sought a meeting with him over his protected disclosure, and that he didn’t seek her out to try to get political support for himself while he was still suspended from the gardaí. In the original protected disclosure, Taylor did not mention having heard Callinan calling McCabe a “kiddie fiddler” after a meeting of the PAC in January 2014. John McGuinness has already testified that he heard such a comment from Callinan on that date. However, in March 2017 Taylor included this comment in a statement to the Tribunal. It was put to Taylor that he only included this recollection of having heard the “kiddie fiddler” comment after meeting McGuinness in person in January 2017. Taylor rejected this, and said that he had given the information to the Tribunal at “first opportunity”. Under cross-examination by Michael McDowell SC, for Maurice McCabe, Taylor said that he didn’t believe he was doing anything wrong at the time he said he was smearing Maurice McCabe and saying he was motivated by revenge. A major bone of contention for Mr Justice Peter Charleton is that of journalistic privilege. Taylor has waived his privilege to be named as the source in the case of the journalists he has named as giving the negative McCabe briefings to. However, a number of journalists he has named have still claimed privilege in this respect. In an exchange with counsel for journalists from the Irish Examiner, Mr Justice Charleton said: “If there’s something else out there, I do need to know about it. They can write a story about it tomorrow, but they don’t have to tell the Tribunal about it? This may present as a major issue later on, with a number of journalists set to give evidence to the Tribunal in late May, into June. If the chairman insists on hearing these journalists say if Taylor briefed them, and the journalists maintain claims of privilege, there is a risk that the Tribunal could be delayed with this specific matter dragged out in the High Court. Before the close of proceedings today, Taylor was repeatedly asked again for details of his meetings with journalists where he gave them these negative briefings. He was unable to provide further details. He will face further cross-examination by counsel for Martin Callinan and Nóirín O’Sullivan tomorrow, before his wife Michelle Taylor gives evidence. Email “'They can write a story about it tomorrow, but they don't have to tell the Tribunal about it?'”. Feedback on “'They can write a story about it tomorrow, but they don't have to tell the Tribunal about it? '”.